I remember seeing this on Ozoz's blog a few days/weeks ago, she's wonderful isn't she! 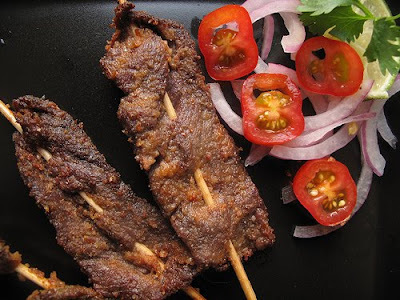 This is like Nigerian satay and I like it already! This looks delicious. Thanks for sharing such a great recipe. I will always think of bird wings now when I eat pressed beef...haha, too funny. These looks delicious, and all the combination of flavors are amazing. I love Kitchen Butterfly! What a great blog. 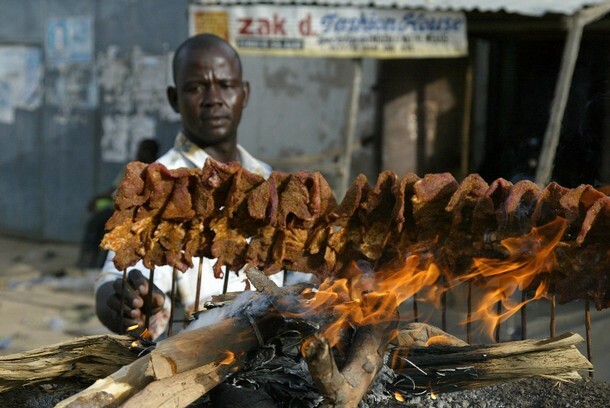 This suya looks delicious...I was hooked as soon as I saw the peanut butter. this is a wonderful recipe and great combo of flavors. great guest post! thanks. yey! a new cuisine to check out, looks delish. wor, looks great and wonderful. Yum! It looks delicious! Thanks for the recipe! I'm new here and will enjoy following to see what's cooking. You have a great informative blog! What a great post!!! I read her original post, I'm glad it is getting seen more, it looks like a very tasty dish! This reminds me of Thai chicken or beef satay. I'd substitute the beef in this recipe with chicken because I don't eat beef. The ingredients are so simple too. What a wonderful post with great pictures and great information. I really enjoyed reading this over. Off to check out her site.